The ADD FILES command illustrated in the screenshot above results from running the syntax below. data list free/v1 v2 v3. data list free / v2 v1 v4. *3. Merge d1 and d2. add files file d1 / file d2. Up to 50 datasets or data files can be merged with a single ADD FILES command. ADD FILES can also be used for reordering and/or dropping variables in a single dataset. This is done by using the KEEP or DROP subcommand. How it works is explained in MATCH FILES. If a variable has inconsistent dictionary information across data sources, you may end up with nonsensical data. This is explained in SPSS Recode - Cautionary Note. For a tool that detects dictionary inconsistencies over files, see Compare Dictionaries over Files Before Merging. If there are string variables present, they should have the same lengths across all data sources. Adjust String Lengths before Merging Files shows how to do this automatically using Python. Especially with many data files, you may want to add the file names as a new variable to the files. Like so, you can easily see the source of each case in the merged data. See Add Filenames to Files Before Merging. An alternative for adding the data sources to the merged result is using the IN subcommand as in add files file d1 /in = d1 / file d2 /in = d2. If you want to merge a lot of files, you can have Python do it for you. This is demonstrated in Merge Many Data Files. 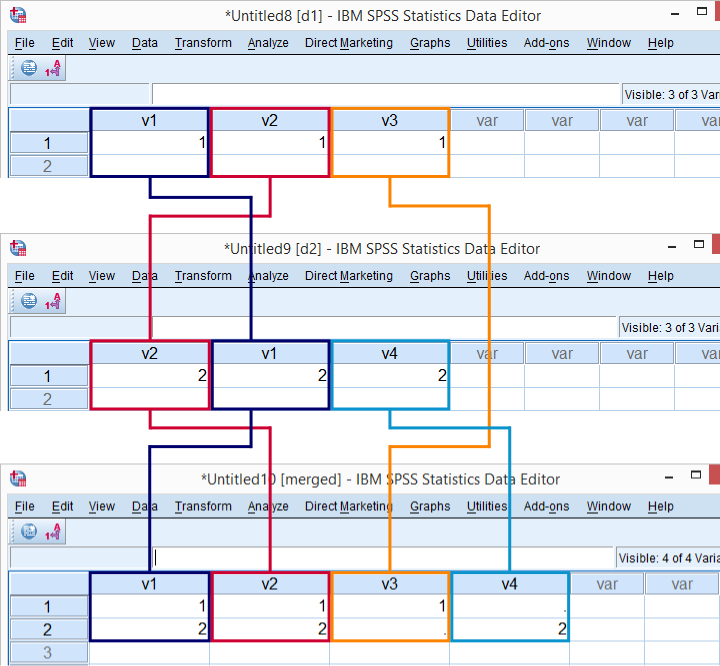 Next tutorial: SPSS VARSTOCASES – What and Why? I considered both tutorials outdated and low quality so I removed them. I should have removed those links as well. I still have the syntax in my archives. It works but it's not well written. I'll send you the files by email. I believe I have used the solution described in the two url’s below and found them very helpful. Both procedures using Python. Now I get the message “Error 404 - Page Not Found”. Is it possible to “activate” the pages I am referring to?